Artificial Grass vs. Real Grass (Pros & Cons) – Which one to go for? The modern technology is faking everything, literally everything! The grass in your lawn has come into its way as well. The technology has made something named “Artificial Grass” as an alternative to natural grass, which actually has a lot of advantages, and some disadvantages too! This grass was made to overcome some limitations that we face with real grass, mainly the maintenance. The artificial grass needs almost zero maintenance which is one of its biggest advantages. However, you’ll need to spend some real money upfront to have this grass in your lawn, which might be one of its disadvantages. Again, though natural grass is tougher to maintain, but no artificial grass can give you the actual feel of natural grass. So, both types have positive and negative attributes which you should be aware of before choosing one for your lawn, or anywhere else. In Simple words, artificial turf is a surface of synthetic fibers that is made to look, and almost feel like natural grass. 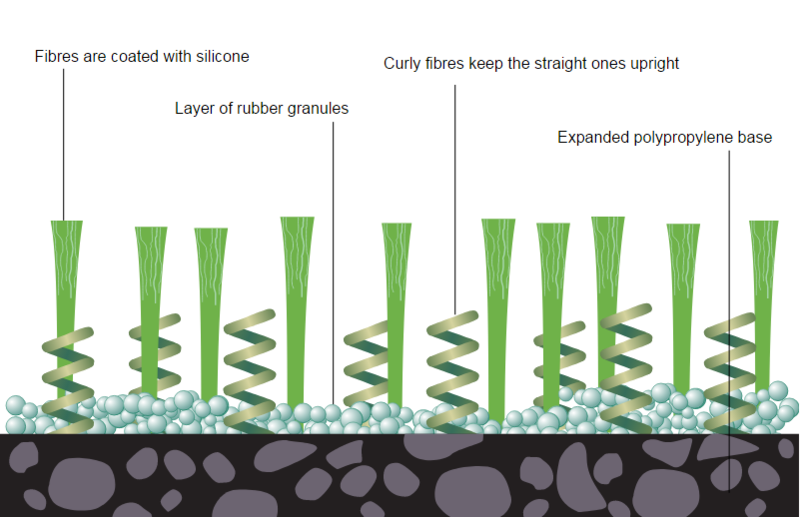 The modern artificial grass is made from filaments, which is threaded into a backing that lets the water through. The backing into it lays on a drainage layer and fastened along the perimeter. Finally, it’s filled with recycled crumb rubber or sand. The modern-day synthetic grass is made of nylon, polypropylene, or polyethylene, which can be colored to look like various species. To know more about artificial grass, go through this article in Wikipedia. Well, artificial grass was actually invented to make your life easier by giving you the freedom from working hard on your lawn. They require almost zero maintenance. Applying insecticide too if any fleas, grubs or other insect pests find your lawn comfortable. Overall, you need to take more than minimum care to maintain a healthy and attractive lawn. But, not with a lawn with artificial grass. This grass requires no mowing, fertilizing or irrigation as well and does not attract insect pests. You can simply host off the grass that got dirty. However, you might need to sweep it periodically with a broom to lift any flat spots where there are matted or tangled plastic blades. But still, it’s a much easier process than maintaining natural grass. So, talking of maintenance, artificial grass has got a marginal advantage over the real grass in artificial grass vs. real grass battle! What do you think? Will technology ever take over nature? I don’t think so. Technology might get so good that it’ll get close to nature, but not enough to take over it. Well, you already know what I’m indicating to. Artificial grass cannot give you that great feel like natural ones. Yeah, some high-quality artificial grasses may give you a somewhat close feel of natural ones, but never as like them. Many people also struggle with the soft rustling that artificial grass makes while walked on. However, the high-qualitygrass imitations are quite soft and many people are quite comfortable walking on it in bare feet, after getting adapted a bit. Then again, while the artificial grass cannot give you the feel of real grass, the look of a high-end synthetic can give your eyes a charm and can easily fool your friends and neighbors. You’ll find some artificial grass with multicolored blades that really look beautiful! So, from the ‘feeling’ perspective, real grass is the winner in this battle, while artificial is not lagging too behind with high-end versions of it that look great and feel close to natural. So, let’s talk about money now! *All these costs are approximate. They can vary a bit depending on the provider. So you can see it’s not cheap to install artificial grass. But it’s not to forget that they require almost zero maintenance cost, while the real ones do. You’ll need to spend money on real ones for mowing, insect control, and irrigation. From a general cost calculation (where I took medium costly artificial grass as standard), I found that it would take about six to seven years for maintenance-free artificial grass to recoup its initial cost (from the money you would need to spend on maintenance for real grass). So, after this period artificial grass will start to save you money as it lasts around 15-20 years. So, we do not find a definitive winner here. If you are a guy who’s willing invest upfront and then get savings from it after a certain period, artificial is a winner for you. But if you have problems investing a big amount upfront, you might be thinking about staying happy with real grass. So, what have you decided? Artificial or Real? Let me make the decision taking even easier for you. You hate working on your lawn and got tired of watering, fertilizing, weeding, and mowing real grass. Your summer water bills are getting too high as you need to constantly water your lawn. You find that artificial grass looks as good as real grass — maybe better sometimes. You can afford the initial installation cost of artificial grass. You rather find it joyous to work on your lawn. You feel nothing can replace feel and charm of natural grass. You have problems investing such a big amount upfront. If you still have problems to decide you can ask me in the comment section. I’ll be happy to help.